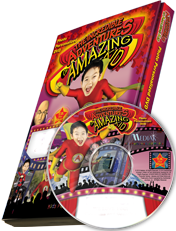 This Photo Personalized DVD features your child as "Amazing Kid". Surpass multiple simulations, cease all Professor Nasty's antics, and become the world-acclaimed hero. The fierce action and fearless demeanor displayed provide lively adventure. 10 action scenes with Amazing Kid photo-personalized to encourage imaginative thinking, a positive attitude, heroic confidence and infinite fun. The child's picture is used 41 times. Length of DVD is approx. 22 minutes.